We are gearing up for Parke Diem on October 14 & 15 and wanted to take a moment to thank one of our biggest supporters from the beginning - Nike. Parke Diem is Portland’s largest citywide volunteer event for the city’s parks and Nike has supported the event since its inception with t-shirts and other gifts for volunteers across the city. 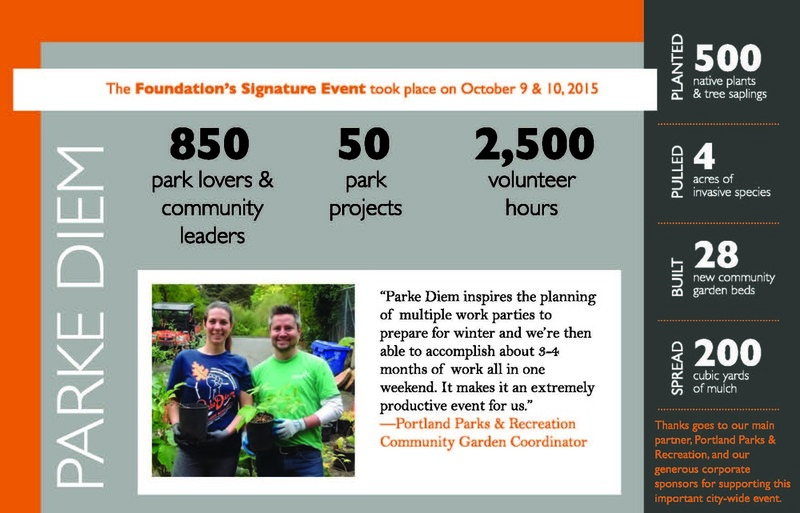 More than 1000 volunteers are joining forces at 58 community gardens, neighborhood parks and natural areas across Portland for Parke Diem’s fourth year. Teams of Nike employees will be volunteering with their colleagues and families throughout the city showing their support for our wonderful Portland park system. As part of its 15th anniversary celebration, the Portland Parks Foundation is also awarding $11,228 in micro-grants to support Parke Diem projects this year and is hoping to raise a total of $15,000 to invest in parks. Installing new trail railings in Forest Park, renovating the display garden at Leach Botanical Garden and installing and winterizing garden beds in 57% of Portland’s community gardens are just some of the exciting Parke Diem projects supported by PPF funds. “Portlanders benefit so much from their parks, and Parke Diem is a great way to give back,” says Portland Parks Foundation Executive Director Jeff Anderson. “We're also pleased to be able to give micro-grants to support Parke Diem’s grass-roots projects--they may be small compared to the $11 million of investments we’ve made in parks and park programs since 2001, but the community volunteers make a little go a long way." Thanks to Nike sponsorship and volunteers, Parke Diem will be a citywide event to remember. Don’t miss your chance to sign up today and give back to the Parks we all love! See all of the hard work you helped us achieve below! The Foundation is in the midst of a campaign to build a footbridge over Burnside where the iconic Wildwood Trail crosses from Washington to Forest parks. Local attorney and philanthropist Charlie Swindells recently joined the effort to chair the Footbridge Over Burnside campaign. We asked Charlie to describe his passion for parks and why he supports the footbridge project. How have Portland’s parks played a role in your life? A couple days after my family moved to Portland in 1974 (my summer before 5th Grade), my mom took me to Hoyt Arboretum. She wanted to ease my shock of "moving to the big city” by exposing me to the extraordinary beauty there. I decided maybe Portland wouldn’t be so bad after all! Since then, my lifelong enjoyment of Forest Park has been measured in dog years — three dogs have been my personal trainers on the Wildwood Trail since high school, and my newest hiking partner is named Marsha. Her ecstatic first day on Wildwood after moving from a kennel in San Francisco is probably my favorite park memory. Why did you decide to chair the Footbridge Over Burnside campaign? I am excited to serve as the campaign chair for the Footbridge Over Burnside because my wife and I drive through the Wildwood-Burnside intersection daily. Even from inside our cars we can feel (and share) the fear and frustration of trail users waiting to "make a run for it." With current traffic levels, the Wildwood Trail is now effectively closed at that intersection for most trail users most of the time. The Footbridge is an elegant solution that will be a destination in its own right for generations to come. What do you think a robust park system does for Portland? Portland's parks mean different things to different people, but the connection they provide to our Pacific Northwest natural heritage is something we all share in common. The Portland Parks Foundation is vital to enhancing our parks network by leveraging private financial resources while serving as a focal point of critical public support. Parks can be too easily short-changed when diverse constituencies are lobbying aggressively for scarce public dollars. As our region becomes more intensively developed, we can’t afford to neglect this community life support system. Support for the Portland Parks Foundation ensures that our invaluable park system is maintained and expanding to serve future generations. Walking through the South Park Blocks, it is easy to see why visitors and residents alike find them alluring. The South Park Blocks combine art, architecture and beautiful gardens to engage the visitor in Portland’s history and future all in just a few steps. Cultural institutions like the Portland Art Museum, Oregon Historical Museum, Portland’5 Centers for the Arts, Portland State University, many historical churches and two farmer’s markets all call the park home. That is why Gunnar Sacher and David Newman got together in 2011 to improve and protect this important community resource. The Portland Parks Foundation started supporting the Friends of South Park Blocks (FoSPB) in 2014 by sponsoring garden bed improvement in the Lincoln Block. Today, the Friends of South Park Blocks serve as an example of the positive difference involved citizens can make in parks, and the Foundation is proud to call them a partner. the park, conducting educational park ‘safety summits’ with local officials, businesses and residents, and recruiting volunteers to give time to clean and maintain this heavily used park. Their work on park safety was one of their first, and continues to be a priority for the group today. “To be accessible, parks need to be safe for everyone. That is why one of our first projects was to support creating the city-wide park ranger program,” said Mr. Sacher. Unfortunately, due to limited resources and re-prioritization of other parks the Friends of South Park Blocks saw a decrease in park ranger patrols in the past year. As a result, the group reinvigorated the idea of Safety Summits with local officials and residents to talk about how to decrease illegal activity in the park and increase overall safety. So far they’ve learned what regulations exist, how those rules are enforced and collected incident metrics. FoSPB will continue the summits in 2016 to come up with ideas and volunteers to maintain and encourage new positive social activity and minimize unwanted social behavior in the park. In the coming year FoSPB hopes to recruit more of the approximately 3,000 neighborhood residents (not including nearby PSU students) to give back by supporting their campaign to install new fencing in the Lincoln Block, increasing positive activity in the park through the foot patrol or other community events, and leading new maintenance teams to beautify the park. “If you live and use services in the neighborhood, you should also give back and participate. We want to feel safe and comfortable in our neighborhood, and this is the best way to contribute and make that happen,” said Mr. Sacher. The Portland Parks Foundation is excited to support the Friends of South Park Blocks outreach efforts this year. You can keep tabs on their work or to volunteer your time by visiting the Friends of South Blocks here.